View Franklin Gutierrez’s player page and the offensive numbers will be overshadowed by gaudy UZR and DRS totals that cement his place as one of the finest flycatchers in the game. Not until one downright inspects Gutierrez’s production with the bat does the best kept secret about his game become transparent. With that said, mentioning Gutierrez’s career high walk rate is a given. 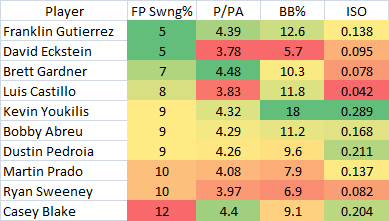 Last year, his first in Seattle, Gutierrez managed to increase his walks while keeping his strikeouts static. That hasn’t been the case this season, with his strikeout rate swelling to over a quarter of his at-bats, but the increase in walks outweighs the shift in punch outs. In 2008, Gutierrez went the entire month of June with a single walk. Thus far in May 2010, he’s recorded as many walks (15) as hits. Expecting Gutierrez to keep up such a torrid pace of free passes is unreasonable, just as trying to assign how much of this newfound appreciation for the walk can be attributed to a weak supporting cast and how much credit belongs to Gutierrez and his devices. One thing is for sure: though Gutierrez may be the master of creating outs on defense, he’s anything but at the dish. We hoped you liked reading Franklin Gutierrez’s Patience by R.J. Anderson! I’m sure if he had anyone competent hitting behind him, pitchers would probably throw strikes to him more, and lower that walk rate. His patience is the class of baseball regardless. It’s nice to see a talented hitter not swinging out of the zone for a prayer of a hit, and take the sure thing walk.